This is my final mock draft before the actual NFL draft. I tried to keep it as up to date as possible with trades and FA signings accounted for. This mock is a what I think will happen based on team needs and previous draft tendencies. Cleveland has to draft a quarterback at one, no questions asked. 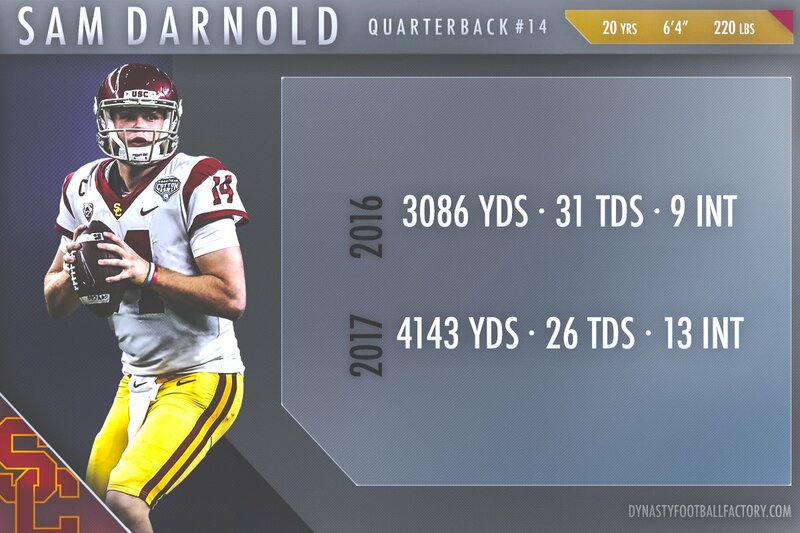 From everything that I’m hearing, Darnold is the man that Cleveland has its sights on. Darnold, while raw with mechanics, has the physical and mental parts of his game that are worthy of the #1 overall pick. Hear me out on this one. Gettleman and the Giants seem committed to staying with Eli for right now and trying to win now with him. That opens the gate right up for Saquon Barkley. Barkley can be a weapon that helps Eli in the running game and the passing game. An offense with Barkley, OBJ, Sterling Shepard, and Evan Engram might be too enticing for the Giants to pass up on. I’m basing this pick purely on track record. Mike Maccagnan has a poor track record of falling for the physical tools of a QB, i.e., Hackenberg. Allen is that QB. They obviously thought highly of him enough to trade up to take him. With new OC Jeremy Bates there to help develop him as well as Bridgewater and McCown ahead of him, Allen can learn behind them and be ready to start next year. Buffalo has made it incredibly obvious they are going to continue to try to trade up. In this scenario, they get pick #4 for picks 12, 22, and 53. If Rosen is there at 4, Buffalo would be sprinting to the podium for him. Rosen is the purest passer in this draft and has everything you could want in a quarterback. 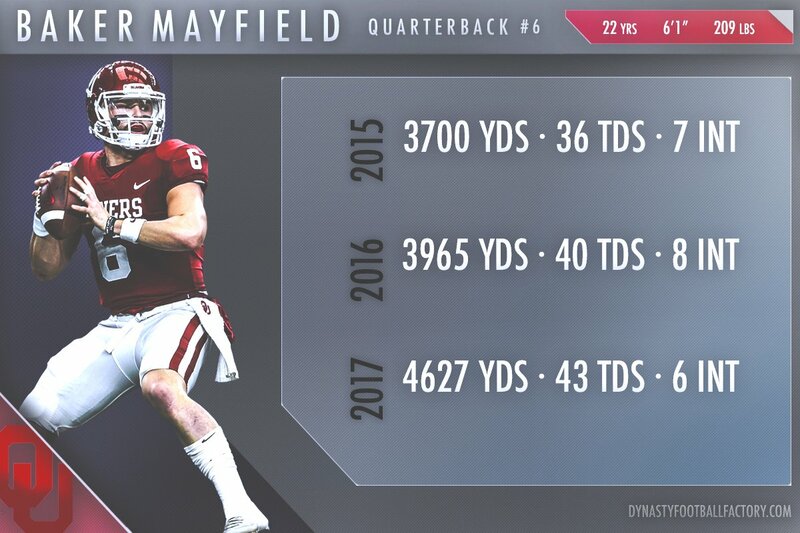 He’d be a perfect Day 1 starter for Buffalo. The Broncos signed Case Keenum, but that won’t stop them from drafting Baker to be their quarterback of the future. He fits right into the Denver offense, and the Keenum signing can give him a year before putting him out there as the full-time starter. I know the popular pick here is Bradley Chubb, but Andrew Luck is the single most important player on the team, and the Colts need to ensure he won’t get hurt again. Nabbing Nelson here shows that they are investing in their OL to protect Luck from injury. Another pick where a team sprints up to the podium here. Chubb and JPP finally give Tampa a pass rush to help Gerald McCoy. Chubb is violent and a gifted pass rusher and is also stout in the run game. With Barkley and Nelson off the board, Chubb is the BPA for Tampa. Roquan is a tough and physical linebacker, something that celebrated Chicago defenses have always had. Adding Smith to an already strong defense makes Chicago a team to worry about after this draft. As good as Reuben Foster was last year, the 49ers need insurance because of his off the field antics. Edmunds is a gifted and explosive linebacker, flying around and making plays all over the field. Pairing Edmunds with Foster gives San Fran a versatile and elite linebacker corps that can lead their defense for years. With the moves Gruden is making this offseason, the Raiders might draft Deion Sanders with this pick. In all seriousness, Ward is the right pick. A smooth and athletic corner, Ward is gifted in coverage and adding him to a young secondary will give Oakland an outstanding secondary for years. 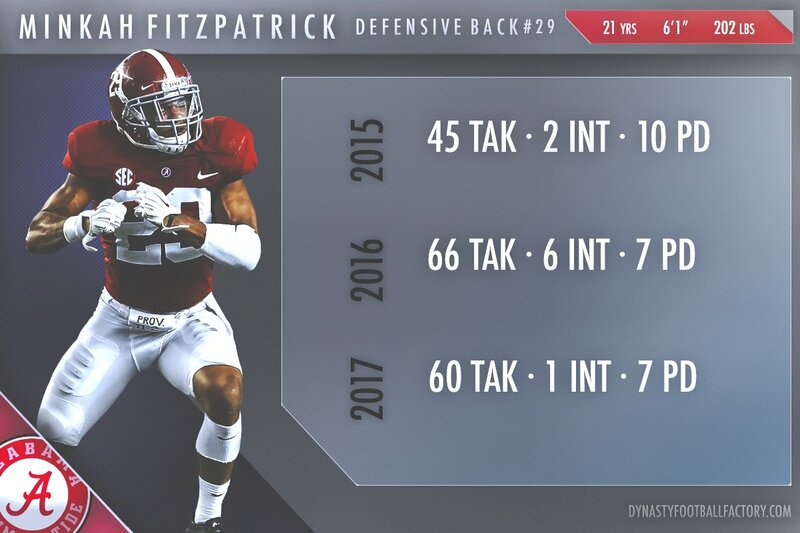 The surprise faller of this draft, Minkah Fitzpatrick is a gifted and versatile safety. He can play the “Free safety” role and roam the secondary and make plays. He can also drop down to play nickel corner if a team needs him to. Miami’s secondary struggled last year, but adding Minkah to it can bring in some fresh air and an exciting playmaker. Cleveland’s secondary doesn’t inspire any confidence, but Alexander does. He can step right in and be a starter for this team. Full of swagger and confidence, Alexander has the skill set and mentality to cover the NFL’s best, and in a division where you have to play AJ Green and Antonio Brown twice a season, you need top-tier corners. Washington needs a tone-setter on defense, somebody to help give their defense that last push from good to great. Derwin is an outstanding tackler and has incredible athleticism. He was used in a variety of different spots at Florida State, showcasing his versatility. Pairing him with Montae Nicholson gives Washington an elite safety corps. Harold Landry is the best pure pass-rusher in this draft class. Possessing elite bend and a great toolkit for a pass rusher, Landry gives Green Bay that edge rusher they have needed for years. Adding Landry to a front line of Daniels, Clark, and Wilkerson makes Green Bay’s defensive line nightmarish. Arizona needs a breath of fresh air, a reason for excitement. Their franchise is at almost an all-time low, and their QB room consists of Sam Bradford and Mike Glennon. Enter Lamar Jackson, the most exciting player in the draft. Jackson isn’t the best passer in this draft, but learning for a year behind Bradford and Glennon while the team rebuilds can give Arizona a deadly combination when Jackson is paired with David Johnson. 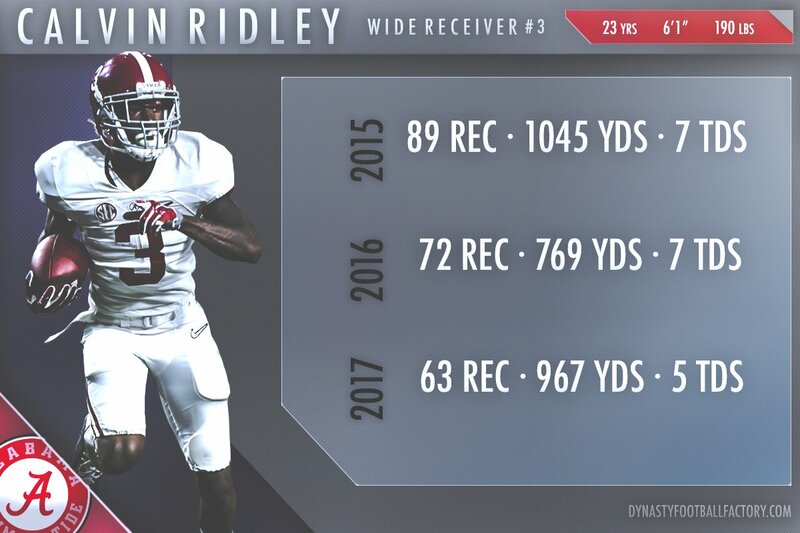 Baltimore’s most significant need is at wide receiver, and with Ozzie Newsome’s fondness for Alabama players, Ridley fits the bill. Ridley is a gifted route-runner, with an incredible knack for getting separation from DBs. Too often he was wide open for a play and Jalen Hurts completely missed on the play. Ridley gives the Ravens a much-needed boost and gives them a home-run threat. The Chargers are one strong draft away from being Super Bowl contenders. They need to patch up their OL first to protect Philip Rivers. With Derwin and other guys off the board, McGlinchey is a BPA need that the Chargers can install right away at RT. The Seahawks need OL, that is no secret. Isaiah Wynn is a versatile piece who can play both tackle and guard. He’s a mauler in run blocking and very stout in pass protection. I debated where to go with this pick, as Will Hernandez is still on the board, as is D.J. Moore. Ultimately, I settled on Rashaan Evans. Evans is yet another elite Alabama LB who can play all over the board. He tackles well and snuffs out the run easily, but he also is a great pass rusher, something you don’t often see with the traditional inside linebackers. With Sean Lee’s age and Anthony Hitchens’s departure, Dallas needs to add talent to its linebacker corps. Evans is a home-run pick here. Guice could have, and probably will go much higher than this pick. 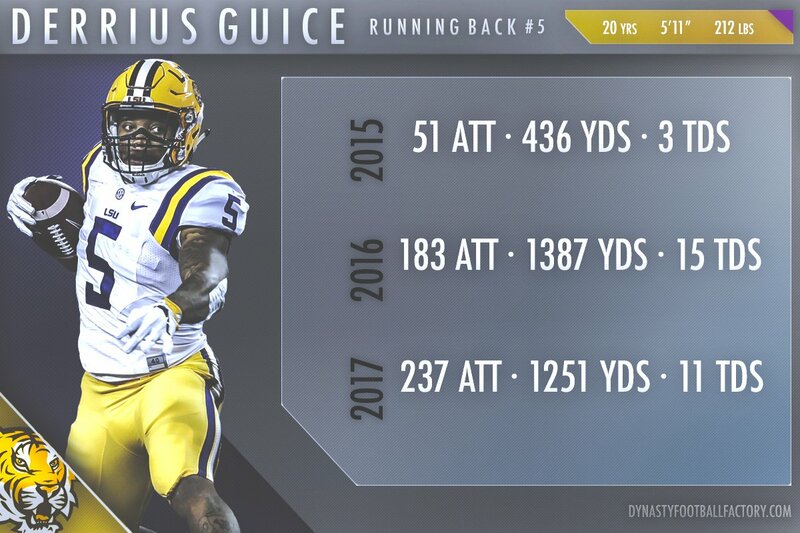 Guice is the best pure runner in this draft and is an incredible talent. Detroit has struggled to find the right running back, and adding Guice gives them a great talent to team with Theo Riddick and Ameer Abdullah. Yes, Will Hernandez and Connor Williams are still on the board, I know. Center, however, is Cincinnati’s biggest weakness on that OL, as Russell Bodine did not play well at all. If they want to help Joe Mixon and protect Andy Dalton, they need to find an upgrade. I still believe in Williams as a very good tackle prospect, which probably puts me in the minority, but his 2016 tape was enough for me to see the talent there with him. Williams gives Cleveland a plug and play LT to replace Joe Thomas and protect their new QB. The Patriots need pass rushers. Sweat is an incredibly athletic talent, but unlike other athletic pass rushers, Sweat has a nice set of tools that he can use to rush the quarterback. Adding Sweat would finally give New England a nice pass rusher. The Panthers’ secondary was rough last year. Bradberry played well, but it is apparent that they still need help. Hughes is an athletic corner who is very stout in pass coverage and can help fix the Carolina secondary and give them a solid corner duo that might be able to cover Julio Jones. The Titans biggest need is a pass rusher. Davenport is an athletic, albeit very raw, stud pass rusher. That upside, however, is too much to pass on for Tennessee. They need to add a young, exciting playmaker to their front seven to wrap up their defensive rebuild. Taven Bryan is an explosive and violent player at DT who absorbs and sheds blocks extremely well and throws guys around. Adding a talented guy on the inside like Bryan to help take away blocks from Beasley and McKinley can only help create more sacks and pressure, which needs to happen when you play Drew Brees, Cam Newton, and Jameis Winston twice a season. There are a couple of guys I could have listed here, but I’m putting Leighton Vander Esch here. New Orleans has been looking for standout LB play for a long time. Their starting LBs are AJ Klein, Demario Davis, and Alex Anzalone. Adding Vander Esch provides a much-needed influx of talent to that corps and can help set the tone in the middle for New Orleans. Pittsburgh still needs a corner, and Oliver’s their BPA here. Oliver is one of the best pure cover corners in this draft. Adding Oliver can help right the ship for Pittsburgh’s secondary. Is Mason Rudolph a first-round prospect? No, not at all. However, he checks off everything Coughlin and the Jaguars want in a QB. There isn’t another player they can justify at this selection. Will Hernandez is still on the board, but they mega-signed a guard, and double-dipping at G doesn’t seem like the right call. Minnesota gets Hernandez. This is one of the best fits in this first round. Hernandez is a violent run blocker who demolishes his competition. With him opening lanes for Dalvin Cook and company, the Vikings are firmly in contention for a Super Bowl run. The Patriots need some secondary help. They cannot throw Eric Rowe out there as a starter next to Gilmore, and Jackson can slide right in at CB2 and help alleviate a troubled secondary with his ball skills and playmaking ability. The Eagles have so many different options they could go with at 32. They could trade down for more Day 2 picks. They could draft an LB or another pass rusher for kicks and giggles. However, Mike Gesicki and his incredible athleticism are too enticing for the Eagles to pass up, due to the loss of Trey Burton. It’s a bit of a reach, but Philly can honestly afford it.